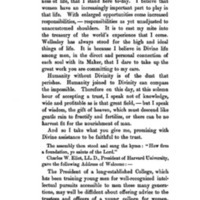 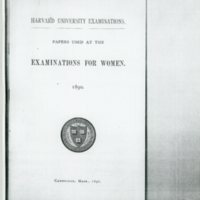 Two newspaper clippings showing girls in training to be WAVES from Mount Holyoke College and Radcliffe College. 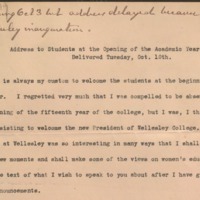 The second is titled "Trampling on Tradition" and is accompanied by a short caption about the women treading ground formerly reserved exclusively for Harvard men. 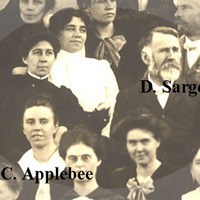 A detail of a group portrait of the class of 1901 of Dudley A. Sargent's Summer School of Physical Training, showing Sargent and Constance Applebee. 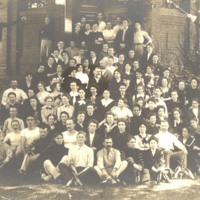 A group portrait of the class of 1901 of Dudley A. Sargent's Summer School of Physical Training at Harvard University, including Constance M. K. Applebee.